SAN DIEGO, Calif., September 5, 2018 - In honor of National Preparedness Month, media and publishing house DawnSignPress offers free samples of their American Sign Language (ASL) publication 100 Signs for Emergencies to every Emergency Service Unit in the country through September. Recognizing the need for basic communication tools, DawnSignPress created a pocket-sized pamphlet of 100 signs that can be used in emergencies. “Past misunderstandings, some leading to tragedies, could be avoided if we learn more about each other,” DawnSignPress owner Joe Dannis said. 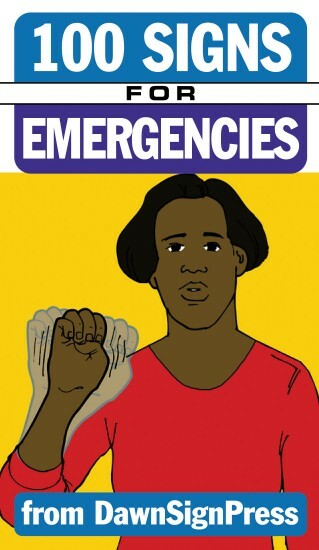 “100 Signs for Emergencies helps first responders communicate basic concepts in ASL." This clearly illustrated pamphlet lists common signs for emergencies, such as transportation (ambulance, car, motorcycle), injuries (accident, blood, identification), people (baby, doctor, interpter), environment (earthquake, snow), questions (what, when, who), and feelings (dizzy, hurt, sick). Also included are the fingerspelled alphabet and numbers up to 10. For those who don’t know ASL this pamphlet offers basic signs that are helpful in the short term and can even be life-saving. An incident more than 30 years ago taught Joe Dannis a hard lesson about the need for accessible communication in emergencies. “I was pulled over for speeding, late at night, at a closed gas station,” said Dannis, who is Deaf. “The police officer wore a motorcycle helmet, so I couldn’t lipad or understand him. I asked him to take it off, but he kept talking.” Dannis walked toward his car to retrieve his hearing aids. “The officer grabbed me from behind, and slammed me onto the hood,” Dannis said. “I was caught off-guard, and had no idea what he was saying behind my back.” Dannis was handcuffed and sent to jail. Dannis isn’t alone in his experience. Around the nation, lack of awareness and accessibility is a reality for the roughly 34 million Americans who are deaf or hard of hearing. To be fair, accessible communication isn’t always possible in emergencies, where first responders’ priority is safety. For most deaf or hard of hearing individuals, the priority is communication — what’s being said, and what’s going to happen. Attempts at remedying this intersection of differing priorities, such as bringing in sign language interpters or using paper and pen, are not always possible. What if a car hits a guardrail and erupts into fire with deaf people trapped inside? Or a deaf person has a stroke and can’t write? Let’s not forget the stress of urgency: most first responders don’t have the time for written conversations with victims or bystanders. Communication isn’t always in place when lives need saving. DawnSignPress is offering a free pamphlet to every Emergency Service Unit making the request during the month of September while supplies last. Send your email request to contactus@dawnsign.com, or call 858 625 0600 to request your copy. Use “Helps with Signs” in the subject line. About DawnSignPress: DawnSignPress is a media and publishing house that develops, produces, publishes and distributes quality American Sign Language (ASL) and Deaf culture-related materials. More information is available at www.dawnsign.com.